Hi, I’m having a problem with some of my animations. My character is an ape and I designed 19 animations. For two of them, sometimes my ape’s hands get “stuck” in place, and the rest of the mesh contorts and distorts as it plays the animation. See screenshots - the first image is when it distorts, the second is when it plays correctly. 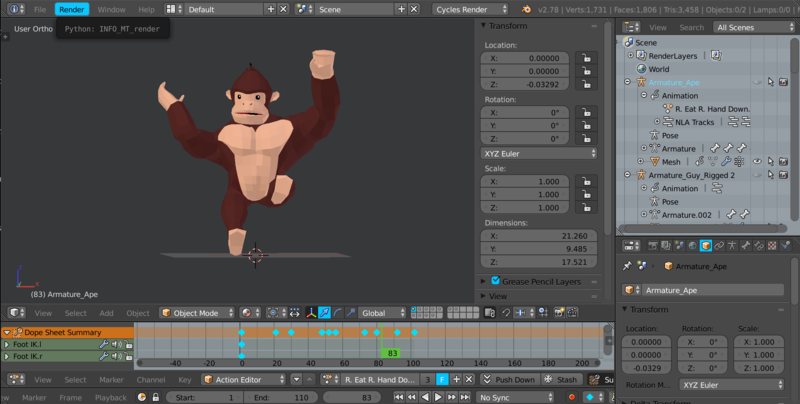 Strangely, I’m able to fix this in Blender by switching back to certain other animations (not just any other animation - it only works with a few). Then when I switch back, the problem animations run correctly and the hands are no longer stuck in place. The big problem is - when I export my model and armature as FBX and import into Unity, those animations always play incorrectly with the hands stuck in place. I think this has to do with the IK bones (inverse kinematics) I applied to the hands at a certain point. But it’s strange because this problem only applies to two animations out of 19. Any advice on how to fix this would be greatly appreciated. The file is too large to upload but I’ll gladly send it via email ([email protected]). Thanks!! Sent a PM… hope I can help. 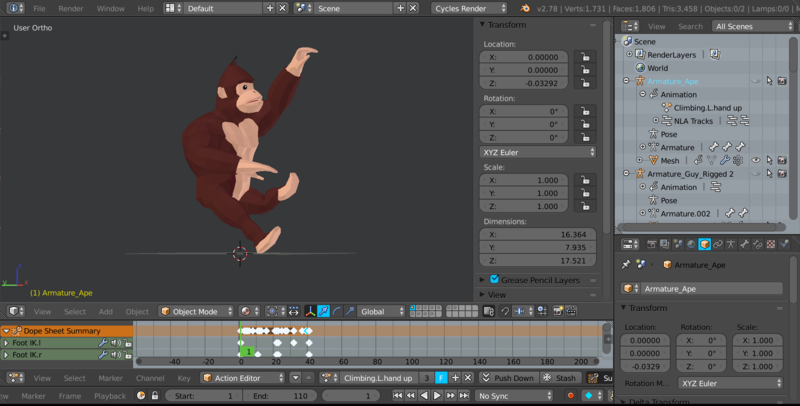 I designed 19 animations for the ape, listed below with notes. (L = left, R = right). *These 5 don’t export with the FBX for some reason. If you have any idea why, please let me know. **These are having the issue where the hands of the ape seem to be stuck in place. I think it has to do with the IKs I applied, but not sure. I discovered a fix in Blender: switch to one of the “climbing” animation, then switch back to one of these. It should fix the problem in Blender. However, in Unity these animations retain the “stuck hands” problem.